Scottish engineer and economist who pioneered the graphical representation of statistics, creating the line graph, bar graph and pie chart. As an engineer, he invented metal-working machines, amongst other ideas that he patented. 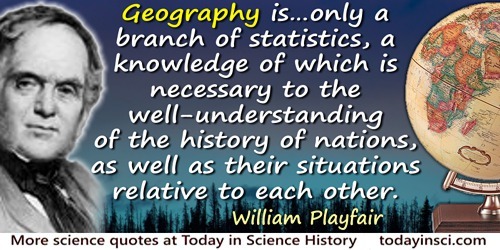 Geography is … only a branch of statistics, a knowledge of which is necessary to the well-understanding of the history of nations, as well as their situations relative to each other. In The Statistical Breviary: Shewing, on a Principle Entirely New, the Resources of Every State and Kingdom in Europe (1801), 5. Next to ignorance of the grammar of one’s native language, nothing betrays want of information so soon as ignorance in matters of geography, without which it is almost impossible to carry on conversation long on any general subject. No study is less alluring or more dry and tedious than statistics, unless the mind and imagination are set to work, or that the person studying is particularly interested in the subject; which last can seldom be the case with young men in any rank of life. In The Statistical Breviary: Shewing, on a Principle Entirely New, the Resources of Every State and Kingdom in Europe (1801), 16. The bushels of rings taken from the fingers of the slain at the battle of Cannæ, above two thousand years ago, are recorded; … but the bushels of corn produced in England at this day, or the number of the inhabitants of the country, are unknown, at the very time that we are debating that most important question, whether or not there is sufficient substance for those who live in the kingdom. In The Statistical Breviary: Shewing, on a Principle Entirely New, the Resources of Every State and Kingdom in Europe (1801), 7-8. [To give insight to statistical information] it occurred to me, that making an appeal to the eye when proportion and magnitude are concerned, is the best and readiest method of conveying a distinct idea. In The Statistical Breviary: Shewing, on a Principle Entirely New, the Resources of Every State and Kingdom in Europe (1801), 2. 22 Sep - short biography, births, deaths and events on date of Playfair's birth.